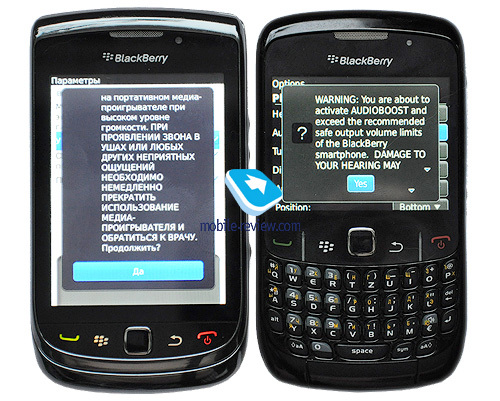 I was lucky enough to use two BlackBerry handsets: 8520, which review you will be able to read soon and 9800 Torch – a dream of millions. Unsurprisingly, many users listen to the music via mobile phones. 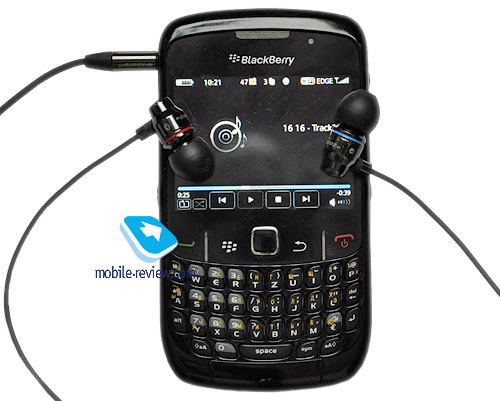 A 3.5 jack allows you connecting any headphones, while numerous headsets like Monster Mobile Jamz can be used as player remotes and handle both models well. I would like to discuss music features of 8520 and 9800 without any far-reaching conclusions. BlackBerry is gradually turning into an accessible working tool and is no longer considered purely an exotic gadget. Apart from work we need time for rest and entertainment. Music is a key element here. Let's start from the player. You can see its interface on photos. In Torch we see something resembling iPhone, which was inevitable, but 8520 devoid of a touchscreen offers more unique and informative solution. Both models can serve as external drives – move sound files and forget about everything else. When you disconnect them from a PC phones scan internal memory and display a tracks list. Insert a memory card and it will be scanned as well. Sadly, there is no navigation in folders (I mean the player only, because phones have a standalone app for that). MP3, AAC, WMA, WAV are supported among other things. 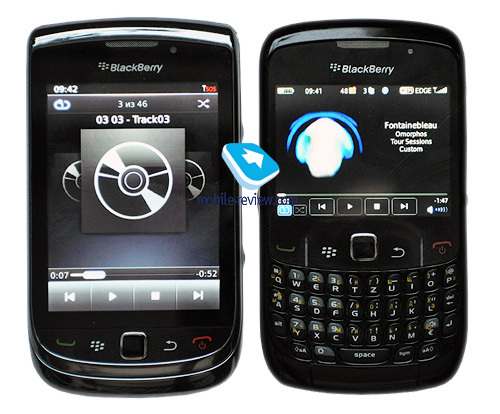 BlackBerry Torch can also handle FLAC and OGG. As to the settings we can use a not customizable equalizer and AudioBoost. I am not sure about the purpose of the latter. Once activated it only increases the maximum volume. Probably, it helps to bypass limitations supported by various associations protecting the ears of Western consumers. Before AudioBoost can be applied you will see a stark warning. In terms of the interface and settings both players are quite basic. 8520 has player controls on the top, but in 9800 you can only make a pause with the help of Mute button similarly located at the top. The volume is adjusted with the help of side volume rocker. Now we come to the key issue – the sound quality. I was going to take RMAA measurements with and without load, but it is hardly entertaining and you would have to analyze many graphs. We will just use our traditional kit: Ultimate Ears UE11PRO and Prime Test CD1. When you connect headphones you will hear complete silence, which can be a sign of a trick. Manufacturers often disable the amplifier power when the audio components are not in use. Start a playback and the power supply will be regained. BlackBerry uses the same approach. When files are read from a memory card you can hear interference and hissing sounds. Nokia (for example E61) had similar results around 4 years ago. 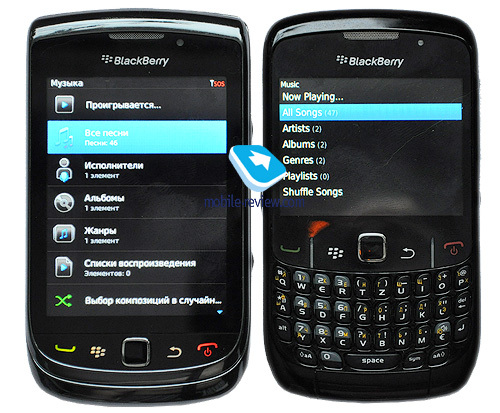 The same happens to BlackBerry 8520 Curve (2009) and BlackBerry 9800 Torch (2010). Interestingly, Curve has less interference, but it is not crucial. You can use less sensitive headphones, but then you may lack volume. AudioBoost does not come into play much. In other words music fans will have to make a tough choice. Overall impressions from the sound vary between two models. BlackBerry 8520 offers crisp, but uninspiring sound. All frequencies are present, but the overall picture is blurred without enough detail. 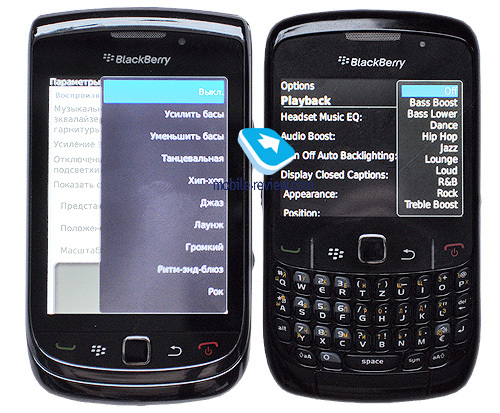 Music of all genres is played similarly in some special Blackberry way. Drums resemble toys, electronic instruments are flat, while vocal parts seem boring. 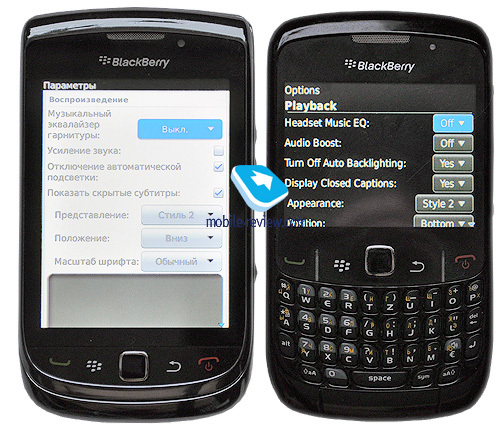 BlackBerry 9800 Torch is a much better proposition in this respect: decent stereo pan with a bit of a depth, prominent bass and attack. The sound is good, but I think we deal with some boosters you cannot disable. Nevertheless, the resulting sound is good, though speedy tracks should be swifter and music in general could be played with more verve. The amplifier noise makes it impossible to put Torch in line with iPhone, Nokia N8 and HTC Desire Z. Torch plays music well and meets demands of modern customers. Developers evidently used Apple interface as an inspiration, but the end product is decent. Moreover, you can easily download FLAC files onto a memory card without using third party apps. 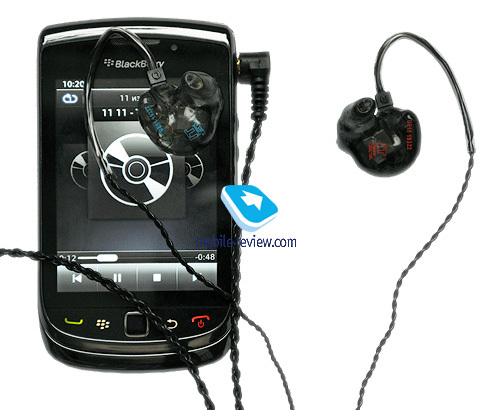 Unfortunately, 8520 is an outdated model, which requires a contemporary player. 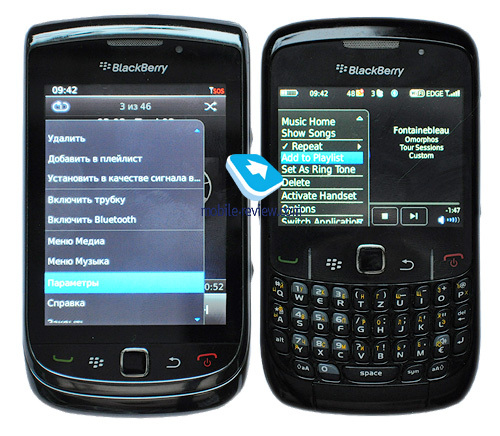 This way you could also save the battery (which is not critical for BlackBerry as Torch offers 30 hours in the mode and Curve must be on par) and enjoy music more. Not every blackberry is beneficial. Torch is cool even despite the looseness in its slider mechanism.